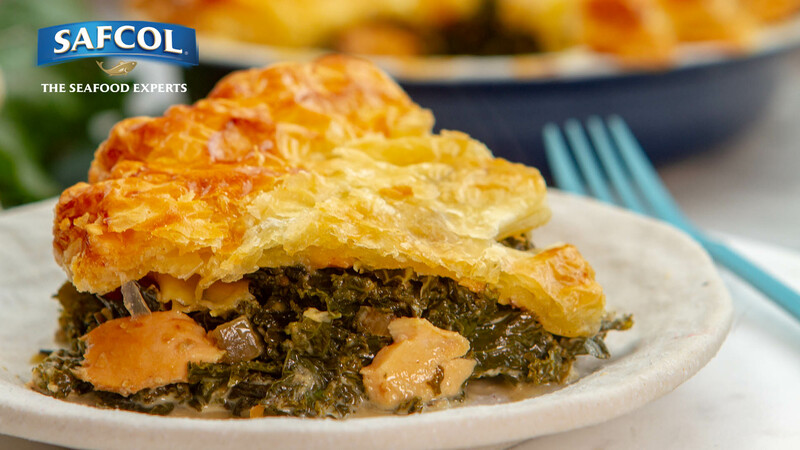 Get all your recommended 5 daily vegetables, in this tasty salmon winter greens pie. It’s just so good. Perfect for a winter dinner. In a large saucepan on a medium heat, add oil. Once hot, add onion and gently fry stirring occasionally, for about 6 minutes or until softened and slightly golden. Stir in the garlic, cook for a further 30 seconds until fragrant. Add the chopped leaves, nutmeg and stir until just wilted. Then stir through the mascarpone, Parmesan and the drained Safcol Salmon and lemon juice. Check the seasoning, transfer to a 20cm oven proof pie dish and allow to cool slightly. Brush the edges of the pie dish with water. Place the puff pastry sheet over the dish and using with a sharp knife, cut it to size. Crimp the edges with your fingers and cut a small whole in the top to allow steam to escape. Brush with beaten egg, transfer to the oven and bake for about 30 minutes or until the pastry is golden brown.